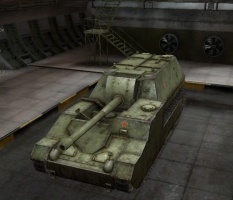 The SU-14-2 is a Soviet tier 8 self-propelled gun. 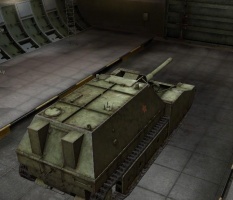 Often known as the "School Bus" due to its shape, it is a worthy successor platform for the 203mm B-4 cannon first available on the SU-14-1 and the S-51. 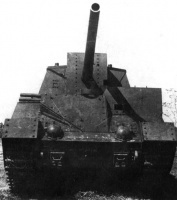 Even though it is one tier higher, the SU-14-2 can still utilise the B-4 to deliver more alpha damage than any other SPG of its tier except the GW Tiger P (which is armed with a slightly bigger 21cm Mörser). 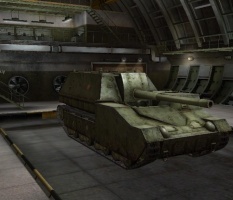 Relative to its predecessors, it has an improved rate of fire (1.5 times as many shots per minute) and some armour to bounce hastily aimed scout shots. 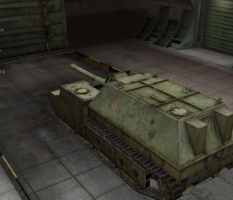 Unfortunately, all this armour comes at the expense of mobility, and the ammo capacity is still as limited as its predecessors (16 for top gun). 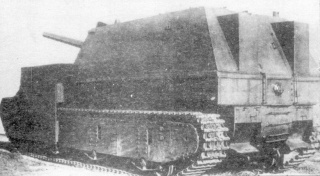 The SU-14-2 leads to the 212A. 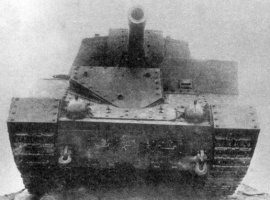 Engine carries over from the SU-14-1. If coming from the S-51, you should research it for more mobility. SU-14 Br2 at Kubinka Tank Museum. This page has been accessed 254,671 times.